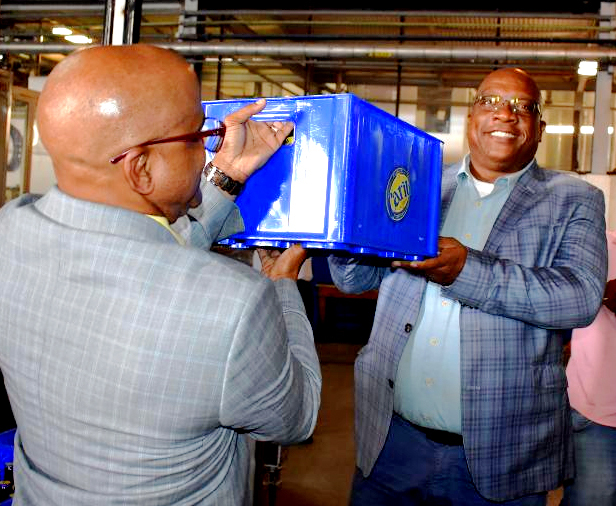 Prime Minister Harris and Minister Grant lift the millionth case of product for the year 2018 off the conveyor line. BASSETERRE, St. Kitts -– The one-millionth case of beverages rolled off a conveyor line at Carib Breweries (St. Kitts Breweries) Limited, on Dec. 14 as the Prime Minister and Minister of Finance Dr. Hon Timothy Harris and Minister of Tourism, International Trade, Industry and Commerce, the Hon Lindsay Grant, and Governor’s Deputy Michael Morton watched. Carib Breweries started operations in 1960 with just one product and now boasts 18 products, crossed an important threshold with the production for the very first time in its history of one million cases of product in a single year. “I want to say special thanks for the invitation, but most importantly to give back a million thanks and more to the Breweries for the contribution that it has made over several generations in St. Kitts and Nevis,” Prime Minister Harris said. “It was a special year as in August the country received the millionth cruise visitor in a single cruise season for the first time,” the prime minister observed. “The week was significant as on Dec. 11 the country received the world’s largest cruise vessel in MS Harmony of the Seas, alongside Norwegian Jade was also making an inaugural call. Dec. 14, when the one-millionth case was produced was also the day civil servants received a double salary, three years in a row. The Minister of Finance said the Eastern Caribbean Central Bank (ECCB), in a report, had documented that the Brewery had done very well and that the sale of alcoholic beverages had gone up perhaps by 30-plus percent. With the production of the millionth case in a single year, Dr Harris added, 2018 could be an outstanding year for Carib Breweries (St. Kitts and Nevis) Ltd. The visitors were taken on a plant tour by Brewery CEO Mark Wilkin. Other dignitaries celebrating the event included Deputy Speaker Senator the Hon Akilah Byron-Nisbett; Local Area Parliamentary Representative the Hon Konris Maynard; Ambassador His Excellency Jonel Powell; and St. Kitts and Nevis Trades and Labour Union officials: President Joseph O’Flaherty; First Vice President Sydney Bridgewater; and Secretary General Batuba Tak.